One of my favorite things to do is get together with friends and talk about books! My daughter and I drove over to a nearby town for a tea party and book exchange at Janelle's Sweet Bee Cottage. We had such a good time talking about books and trying different teas. Janelle was a super hostess and her daughter was the sweetest mini hostess too! Janelle calls her daughter, "Baby Bee" and we were all entertained by her. She was having as much fun at the grown up tea party as the grown ups! Janelle has a garden room-dining room and the table was set with a burlap tablecloth, vintage dishes and books. I borrowed the table setting picture from Janelle's blog. I was talking too much to take out my camera. I did manage to take a picture of her adorable craft room as we were leaving. She has so many cute decorating ideas. If you haven't visited Janelle take a peek at her blog and see the chalk board she made from a door. She's also having a giveaway to celebrate spring and her 400th follower. Look at all of these wonderful goodies!! Go visit Janelle and tell her I sent you. I'm hoping she'll invite me back for more tea and scones soon!! First, let me say, thank you to everyone who left me such sweet comments about the magazine article!! I keep getting it out and looking through it. I think my mom has mentioned it to everyone who has called or visited this week. I thought I was done making pincushions but I made two this week and they were so much fun. This one went to Audrey in Massachusetts. The other one is still a secret. I can't wait to show it because I love it!! It has been raining like crazy here, but, there was one day with some sun. My son wanted to earn some money so I put him to work painting my little antique chest. What a difference a little paint can make! Do you know that my husband actually loves that pink paint? He always steals my pink chair at the table too. He's color blind, so I don't really know what pink looks like to him. I've always wanted to see the world through his eyes. I wonder if there's a website for that. We found new handles for it at Lowes. I thought they had a vintage look to them. The top of the cabinet is looking rather bare. I need to move some of the junk from the china cabinet over to it. Someone buried all of my Easter decorations under the Christmas decorations and I haven't had the ambition to go find them yet! When I wasn't sewing pincushions and supervising the painting, I was making postcards for Nataleas' Post Card Swap. I printed my postcard from my Etsy file of sold pincushions. Natalea asked us to share a favorite quote on the back of the card. Mine was "Have nothing in your house that you do not know to be useful or believe to be beautiful" by William Morris. I really, really need to remember this when I am out at estate sales and the thrift store! Thanks for reading my rambling post. I've kind of had a rambling week putzing around waiting for the rain to stop. Happy Pink Saturday. I think my pink chest qualifies!! Make sure to go visit Beverlys to see more pink posts. Oh my goodness! I wonder how many posts I've started wiht those three words? I just can't help but "say" them though! 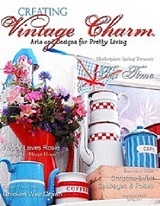 I just received my copy of a new magazine called Creating Vintage Charm. The editor contacted me a few months ago about using some of my pictures from flickr in the Spring issue. I automatically told her that she was welcome to use my pictures. I ordered myself a copy thinking there might be a little picture somewhere. My copy came in the mail today and I was so excited to see not just a little picture but two whole pages!! What is even more thrilling to me is that Happy Harris from Happy Loves Rosie is on the front cover!! I have loved her blog and her style from the moment I came across them on the internet! I'd never even heard of Cath Kidston until reading Happy's blog! To be featured in the same issue is just "over the top". I hope I'm not gushing! Ok, I know I'm gushing but I simply can't help it!! Of course, my studio looks a little different now. I have a dining room at one end and there's usually a dog under foot somewhere. My aqua cabinet has been joined by a much bigger cabinet which gives me more room for all of the doo dads that inspire me. It is still the place where I try to "sew pretty", play with paper and clay and do lots of daydreaming! Not to mention blogging!! Happy PInk Saturday! At least half of the pictures in the article were Pink Saturday pictures! Thanks Beverly for always inspiring me to create in "pink". Every year at this time my husband turns into a blarney spouting, jig dancing leprechaun. Just donning his costume is enough to take him back to his Irish roots. Every limerick, Irish blessing and curse is remembered and delivered in a thick Irish brougue. I don't know where it comes from. I just know that my mild mannered hubby is suddenly transformed into Blarney Bill. We look forward to it every year! a sky that's always blue. It's Pink Saturday and I am hoping my resident leprechaun will fill my cup with coffee, pour me juice and make me some oatmeal. I think I deserve it. After all if I weren't for me, he'd be a naked leprechaun. I've worked all night to make him a new shirt so he could do a jig in today's St. Patrick's Day parade. I'll share pictures on St. Patrick's Day!. Do you see my dishes? I have been looking for pink bowls to go with my Fiestaware. On Monday, a package came in the mail. I opened it up and was stunned to see four pink bowls and three juice cups. I immediately went to my Paypal to see if I had forgotten buying them. Nope!! Then I remembered that my new friend Audrey had emailed me telling me she was sending me something special!! Oh my gosh!! Can you believe it?! Audrey emailed me one day through Etsy telling me how much she liked my pincushions and my blog. We've become friends and I have tried to talk her into starting a blog. Audrey read my post about looking for pink bowls and found some for me on Ebay. The luck of the Irish was surely with me the day she stopped by my blog. Can you believe it? I am early with my tag for the Happy Homemaker tag along. I couldn't wait to use Goldilocks for my March tag. She just says Spring to me! I wish you could see the layers better. I cut out two of the images leaving the cute little bear off the top image. Then using pop dots I layered Goldilocks on top so that the bear peeks out from behind her skirt. I also used some of my Dresden scrap, that I have been hoarding, for her bouquet. I love her! Do you see what I found at Tuesday Morning? The cutest Childlife book tin . I'll be putting my Storybook tags in here to send to my partner at the end of the year. My hope is to swap tags with someone who has a daughter or grand daughter. I can just imagine some little cutie, with the box on her lap, taking the tags out one by one. If anyone has a Tuesday Morning by you and can find me another box, I will pay you for shipping it or even do a trade! Beverly was sweet enough to ask me to be the featured blog for Pink Saturday! I wasn't sure what I would share today. I sent Beverly a picture of part of the spring display on my piano. As you can see, I found something else perfectly pink to share with you instead. I have to tell you the story of my quilt in the making. My hubby and I were driving by one of our local antique stores on Monday. Displayed on a quilt rack out front was a dresden plate quilt. It was in pinks and sew pretty! I told my hubby that I loved it but that it would probably be way out of my budget! I said, "Besides, I should just make myself one". Today there was a garage sale and the ad said, "fill a bag with fabric for ten dollars". It just happened to be close by too. When I arrived, there were two tables filled with boxes of fabric. The boxes were sorted by color. I immediately headed to the pink box. I picked up a stack of various pink squares. When I got home and started sorting it out. I gasped! The fabric squares were all marked with the dresden plate quilt pattern!! So far I have about 60 pieces or five dresden plates!! I think Beverly brought me some Pink Saturday luck!! Have you heard of PInterest yet? It's my new addiction! Two weeks ago, I was supposed to have laser surgery on my eyes for my retinopathy. When I couldn't even see the BIG E on the eye chart with my right eye, plans were changed. Blood in my retina had obstructed my view and the view into the eye by the surgeon. Instead, I had an injection of a medication directly into my eye to dissolve the blood. In the meantime, I can't do any prolonged bending over. I have to sleep propped up, etc. Which means no heavy cleaning, no weeding and no planting flowers. You can imagine that I am probably going crazy. Enter Pinterest! I can see fine with my left eye. So, I sit here, with my right eye closed or wearing a pirate patch, looking at pictures on Pinterest. You can create your own boards of favorite pictures. You can follow other people's boards. Which led me to Paula's Red and Aqua board and this adorable bluebird bank. It's from Urban Outfitters. I told my hubby that I "needed" it and he agreed. I didn't really need it but it is so cute and it is already right at home in my house! !